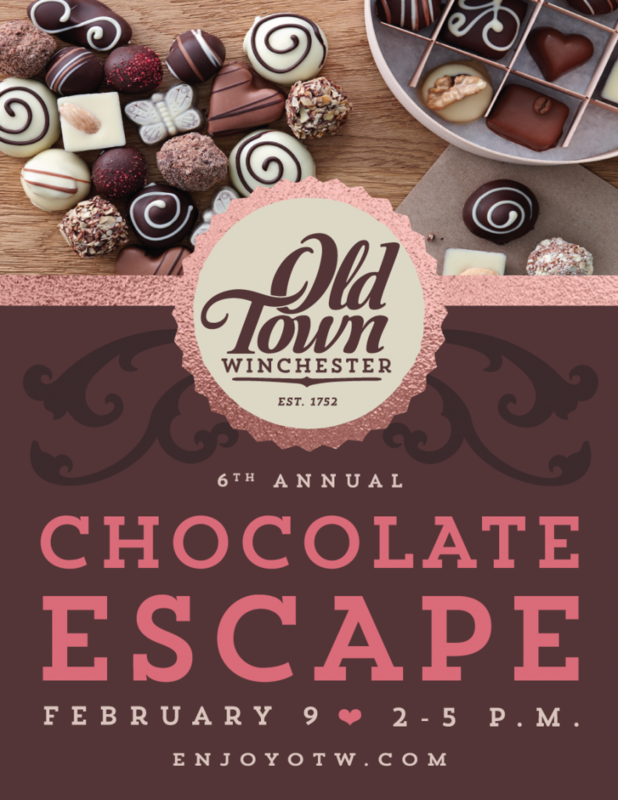 Escape to Old Town Winchester for Valentine’s shopping specials and indulgent chocolate morsels at the 6th Annual Chocolate Escape on Saturday, February 9, 2019 from 2 p.m. to 5 p.m. Sample chocolate desserts at participating downtown restaurants, enjoy special discounts and treats at participating shops, listen to live music, and pamper yourself during the fifth annual Chocolate Escape! There will be downtown restaurants offering a variety of $3 chocolate dessert samples and downtown businesses offering not only promotions, but chocolate treats as well. Follow the red balloons to participating locations! Diners and shoppers will have the chance to make Valentine’s Day reservations and purchase gifts for loved ones or just browse. Old Town Winchester offers fine dining, artisan shops and specialty boutiques, florists, jewelry stores as well as a day spa and a salon. Escape to Old Town Winchester for Valentine shopping specials and indulgent chocolate morsels. 147 North will offer a “Death by Chocolate” Chocolate Cupcake; Caramel Hot Chocolate. 50/50 Taphouse will offer chocolate beers and several bacon and chocolate creations. The Black Rose will offer Mexican Hot Chocolate or Traditional Hot Chocolate; Dark Cocoa Cookies. 25-60% off selected items. Brewbaker’s Restaurant will offer Chocolate Cherry Brownies; Chocolate Dipped Bacon Knots; and Chocolate Mousse Cups. Bright Box Theater will offer a Chocolate Cheesecake Bar with a chocolate graham cracker crust; Chocolate Turtle Fudge; 10% off Bright Box gift certificates. Cork Street Tavern will offer a Quadruple Chocolate Tartlet with chocolate graham cracker crust, chocolate mousse, dark chocolate topping, and white chocolate mousse with raspberries; Chocolate Chicken Mole Skewers. Chocolate beers on tap. El Centro will offer Chocolate Flan Cake, a rich chocolate cake topped with caramel flan. Espresso Bar & Café will offer Handcrafted Truffles; 4oz Hot Chocolates. ‘Fellowship of the Sip’ Organic Tea House will offer Chocolate Ginger Spiced Cake with Chocolate Sauce and Whipped Cream; Drinking Chocolate. 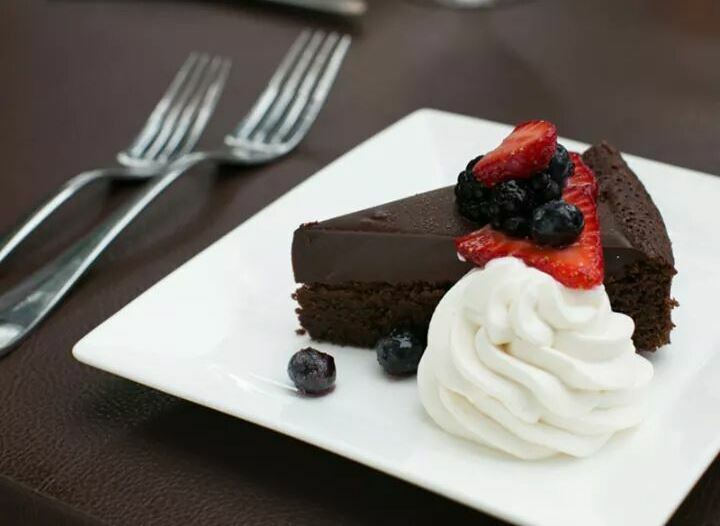 George’s Food & Spirits will offer Homemade Dark Chocolate Ice Cream; Individual Triple Chocolate Cakes; Chocolate Creme Brulee; Mini Chocolate Martinis. The German Table will offer Chocolate Caramel Crunch Cakes. Piccadilly’s Public House and Restaurant will offer German Chocolate Bombes. Specialty drink available. Red Fox Creamery will offer a Mini Brownie Ice Cream Sandwich with homemade brownies and homemade chocolate ice cream. Union Jack Pub & Restaurant will offer Campfire Naan Flatbread with Nutella spread, chocolate morsels, mini marshmallows, and a graham cracker crumble; Naan Flatbread with Nutella spread, sliced banana, and caramel drizzle. Village Square Restaurant will offer a Chocolate and Espresso Ice Cream Pave and a Mexican Hot Chocolate. Violino Ristorante Italiano will offer Homemade Gluten Free Chocolate Hazelnut Truffles and White Chocolate Covered Strawberries. Water Street Kitchen will offer Belgian Chocolate Milkshakes and Chocolate Peanut Butter Pie. Winchester Brew Works will offer a 4oz sample of Chocolate Raspberry Big Schloss Imperial Stout for $3. Bluebells invites you to come in between 10 a.m. and 5 p.m. on February 9th to place a Valentine’s Day order and receive 15% off flower orders over $60 (before tax and delivery fees if applicable – excludes wire-out orders). Bluebells will also have a candy dish filled with individually wrapped chocolates for anyone who comes in during the Chocolate Escape. Compass West Realty will offer delicious chocolate treats from 2-5 p.m.
Julie Napear Photography is offering 15% off booking a professional headshot when purchased during the Chocolate Escape. Chocolate Oreo cupcakes with peanut butter Oreo frosting, no-bake and double chocolate cookies. Eugene B. Smith Gallery will offer sweet treats and deals. 14% off prints and framed prints for that special someone! Handworks Gallery will offer 14% off all jewelry from 2-5 p.m.
IFO will offer free samples of chocolate covered insects, while supplies last. Kimberly’s will offer 15% off purchases and chocolate and wine tastings. Kindred Pointe will offer wine/hard cider and truffle pairings. 14% discount on all retail merchandise. Knit 1 Purl 2 will offer 20% off all yarn and novelty flags. Assorted chocolates including truffles, kisses, and other individually wrapped chocolates. 10:30 a.m. – 5 p.m.
Love’s Affect Jewelry will offer 20% off in store and chocolate treats. Also offering a Galentine’s “Bubble + Beads” Event (advance tickets required). Come with your gal pals to create your own jewelry! LoX Salon will offer your choice of Luxury Shampoo with hot oil treatment, chocolate facial and blowout ($60) or Sweetheart Blowout with deep conditioning treatment ($45) from 9 a.m. – 5 p.m. Indulge in champagne, chocolate covered strawberries and treats. Call 540-773-4558 to reserve your spot. 20% off all ladies sportswear, technical outerwear, women specific equipment (backpacks, sleeping bags, trekking poles, etc..), footwear and socks. 20% off all two person sleeping bags and sleeping pads. 20% off all Petzel headlamps. Also offering homemade brownies and a copy of the recipe to give away. Murphy Beverage Company will offer a wine tasting with Ports and Fortified Wines. Treats from the Chef’s Market. Once Upon A Find will offer a 14% off Valentine sale. Free chocolate chip cookies and complimentary hot chocolate with each purchase. Enter for a free drawing, no purchase necessary. 10 a.m. – 6 p.m. The Polka Dot Pot will offer free m&m’s for all painters. Posh Pets will offer 20% off doggie iced Valentine cookies. Chocolate treats on hand for pet owners. Richard’s Jewelry will offer 20% off purchases (some exclusions apply) and sweet treats. Thinker Toys will offer demonstrations of “Chocolate Fix” a single player logic game and a drawing to win one (1) game. Tin Top will offer an Immortal Mountain Chocolate tasting and pop-up shop. 20% off sale on jewelry, men’s accessories and Valentine’s Day cards. Wilkins’ ShoeCenter says “Who doesn’t like chocolate and 14% off?” Saturday between 2-5 p.m. only, some exclusions apply. 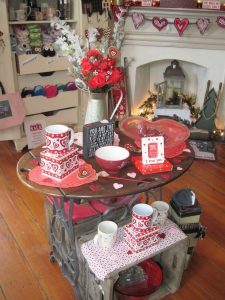 Winchester Book Gallery says “What makes for a cozy Valentine’s Day celebration? We think—Hot Cocoa, Thrilling Books, Great Cookies and Fun Crafting!” This year the Winchester Book Gallery is celebrating Chocolate Escape with all three by offering a little bit of each for everyone along with plenty of chocolate themed books and Valentine’s cards. Worlds Away Escape will offer 10% off gift certificates purchased in person only. Chocolate treats for anyone stopping in for information or sessions. Shenandoah Valley Discovery Museum will offer chocolate related activities including: a hot cocoa craft, graphing favorite chocolate candies, hidden kisses scavenger hunt, and recipes to make your own hot cocoa and chocolate ice cream. (No food offered in the museum). Featuring canvases created by the community for First Night Winchester. Enjoy “Kisses” and Kindness.